Mediterranean countries are all in the same boat: they don't want ships carrying rescued refugees to dock at their ports. That approach poses a big problem for aid organizations. DW's Bernd Riegert reports from Brussels. 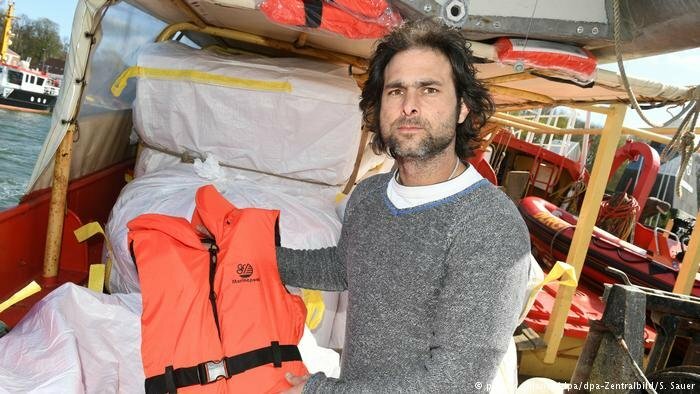 Repeated cases of refugee rescue boats being turned away from European ports have sparked anger among aid workers and religious authorities. Meanwhile, Italian, French, Spanish and Maltese politicians continue to squabble over who has to take in boats that have picked up stranded refugees in the Mediterranean Sea. In January 2018, Italy renounced its obligation to let all refugees, asylum-seekers or migrants disembark who had been rescued in the Mediterranean Sea between Italy and Libya. The mandate for the most recent border protection operation initiated in January, dubbed Themis, no longer stipulates such an obligation. Italy's new far-right interior minister, Matteo Salvini, is now implementing this policy in a ruthless manner. He has announced that his country will no longer accept any castaways. He refers to the people on board the rescue boats, which are sometimes privately owned, as "meat" or "goods." "We are the boss in our own house," Salvini wrote on Twitter, threatening that "the good times" for migrant rescue organizations were "really beyond." Read more: Can EU summit help Merkel survive her domestic battle over migration? Michael Buschheuer, founder of the rescue organization Sea-Eye, which is based in the southern German city of Regensburg, is not at all surprised by Salvini's rant. "Those tactics have been going on for more than a year now," he told DW. "Since March 2017, all European governments have developed a tendency to clandestinely combat NGOs, get rid of them, block them, putting obstacles in their way. This is just a logical, but also an accelerated continuation of that movement." In Italy, rescue workers had been under investigation because they allegedly collaborated with human traffickers in Libya. This investigation was officially terminated last week by a judge in Sicily for lack of evidence. To date, the Rome-based Maritime Rescue Coordination Center of Italy's navy has mandated and organized all rescue operations and the distribution of refugees across Italy's ports. So the country's navy is itself responsible for the lion's share of rescued refugees. In conjunction with the border protection mission Themis and the EU naval force mission Sophia, the military was responsible for rescuing more than half of all castaways from maritime distress in 2018. "In this sense, what we did was at no point in time different from what any European or American boat did when it was in the region," said Buschheuer. "We don't have any other agenda except for maritime rescue. Therefore, all those continued accusations and blockades hit us very hard." According to Frontex, the European border and coast guard agency, some 15 member states participate in EU missions to strengthen Italy's coast protection and scare off human traffickers from Libya. Interior Minister Salvini's claim that Italy was completely left on its own is, therefore, incorrect. Salvini's call to close his country's ports was countered by Defense Minister Danilo Toninelli, whose responsibilities include the Italian navy. Thus far there hadn't been any administrative procedure aimed at closing a port — this was only possible if an infectious disease broke out on board a ship, or in the event of a terrorist threat. According to international conventions, Italy, Malta, France and Spain must allow boats carrying rescued castaways to dock at their harbors, if nourishments are no longer available on board, or in the event of any other emergency. "There is an obligation to rescue people in the open sea," Stefan Talom, a Bonn-based professor of maritime law, told DW. "With respect to what happens afterwards, regulations are less clear." Whether people are allowed to disembark in a port was a different issue, he explained, as the law only stipulated that they had to be taken to a "safe haven." "Italy is not the first country to close its ports, but the most recent," said Buschheuer. According to him, the other Mediterranean states already sealed themselves off years ago. "It's not only Europe we hold liable — we would, of course, expect also countries like Egypt and Tunesia to accept refugees, to actively rescue those in distress, and to take care of the people at least in a way that ensures they don't have to fear for their lives." Prior to their upcoming summit, EU leaders have held intense discussions with respect to a unified European migration policy. The lowest common denominator, established during informal talks last Sunday, was better protection of the EU's external borders and keeping people from entering the bloc. Migrants are to be deterred from embarking on the hazardous passage across the Mediterranean in the first place. For some time, this has been a resolution agreed upon by the EU's interior ministers. Someone who has slim prospects of being rescued from their inflatable dinghy may not embark on the journey at all — that's the ministers' reasoning, in a nutshell. 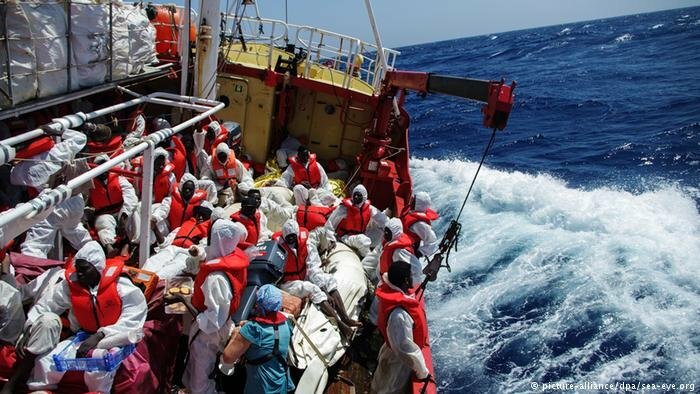 For this reason, Frontex last year criticized the partially private maritime rescue missions as a "pull factor," or rather, an incentive for flight and for paying thousands of euros to human traffickers for a seat in a dinghy or an unseaworthy wooden barge. "If we disappear now, not just Sea-Eye, but all NGOs, it will be much easier for Libyan and European forces to push the people back," said Buschheuer. In a deal Italy has made with the Libyan authorities — and possibly with militia leaders — it was agreed that as many migrants as possible would be held back in exchange for monetary payments. The EU, meanwhile, is supplying the Libyan coast guard. According to the International Organization for Migration (IOM), a UN agency, those measures are making an impact. The number of refugees who completed the passage across the Mediterranean to Italy has decreased to 16,400 during the first half of 2018, compared to 73,000 during the first half of 2017. At the same time, the number of people from Africa who cross over to Spain has increased sharply. At least 635 people are known to have drowned this year on the route between Libya and Italy. To date, according to international agreements, Italy had been responsible for sea rescue operations in the large maritime area between its own coast and Libya. That is going to change shortly, Italian government circles maintain. Libya is to take up partial responsibility, organize rescue operations and return rescued people back to Libya.